These three biopharma stocks could see sales increase by a factor of two next year. The definition of a "high-growth stock" can vary depending on who you ask, but companies on such a list should be growing sales at a consistent, double-digit clip at the least. Then again, there are always outliers. Biopharma companies with a new product on the market -- especially if it's their first -- can see triple-digit sales growth under the right circumstances. It isn't common, and these stocks are by no means guaranteed to double revenue in 2017, but investors on the lookout for high-growth outliers may want to keep an eye on Keryx Biopharmaceuticals (NASDAQ:KERX), ACADIA Pharmaceuticals (NASDAQ:ACAD), and Cara Therapeutics (NASDAQ:CARA). In late 2014, Keryx Biopharmaceuticals received marketing approval in the United States for its first drug, Auryxia, which is for controlling phosphorus levels in the blood of patients with chronic kidney disease. The company has no pipeline and is completely dependent on sales of Auryxia. Investors were fine with that reality, especially considering peak sales of the lone drug were originally pegged as high as $1 billion in the United States. Throw in royalties from sales in Japan and the potential for royalties or direct sales in Europe, where the drug is approved but waiting for a commercialization partner, and it's easy to explain investor enthusiasm. Unfortunately, prescription volumes have largely failed to impress. As if a slow start weren't enough, sales took a hit in the second and third quarters of 2016 after the company's lone manufacturing partner encountered issues finishing the product. The potential blockbuster has netted just $18.9 million in U.S. sales through the first nine months of 2016, despite having been on the market for 22 months. The good news is that a new manufacturing partner was announced in early November, which should re-establish supply and the drug's growth trajectory. That will help to boost sales next year. Additionally, if Keryx Biopharmaceuticals can find a commercialization partner in Europe, then it could be in store for an upfront collaboration payment, in addition to royalties and/or direct sales. It's too soon to say if the short disruption in Auryxia supply will have a long-term impact on prescription volumes, but the company is entering 2017 with momentum relative to a year bogged down by hiccups. In other words, the bar is pretty low. 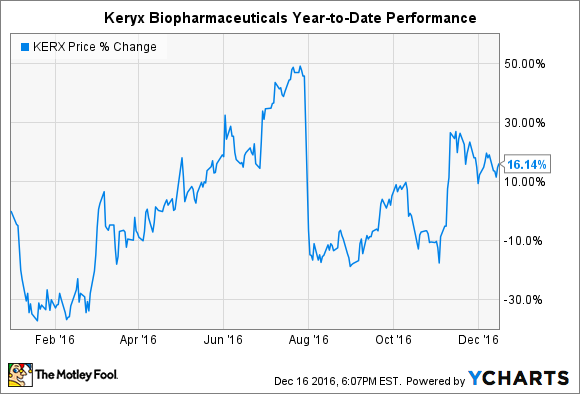 If Keryx Biopharmaceuticals really does have a potential blockbuster on its hands, then revenue could double in 2017. 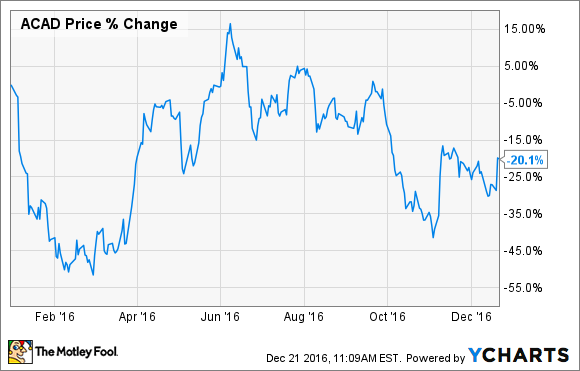 I'm cheating here a little bit (and below, too), but ACADIA Pharmaceuticals should easily see sales double in 2017. Why? It recently received marketing approval for its first product. In other words, it was essentially a pre-revenue company as recently as the second quarter of 2016. Nuplazid has enjoyed a much faster start out of the gates than Auryxia, netting $5.3 million in sales in its first full quarter on the market. That smoked Wall Street estimates of just $2.9 million, although drug launches admittedly have a high degree of variability baked in. The drug treats Parkinson's disease psychosis, a condition that affects an estimated 400,000 individuals in the United States, and is the only effective treatment option at the disposal of physicians. Better yet, it's being investigated in additional trials for treating similar neurological conditions that have the potential to blow the market opportunity wide open. ACADIA Pharmaceuticals has a low bar to cross to double revenue in 2017. Barring any unforeseen circumstances, it's basically a slam dunk. But, as the company's 20% year-to-date retreat suggests, there are other things on the minds of investors. The company has increased its share count by 16% since the end of 2015. That has allowed it to pile up cash to the tune of $588 million as of the end of September, without taking on a penny of debt, but it has also diluted investors. Of course, if most of the company's near-term financing has concluded, then investors could see the stock's current price as a buying opportunity. My second "cheating" pick is Cara Therapeutics, which is still a pre-revenue company. Unlike ACADIA Pharmaceuticals, however, there are no approved drugs in the company's portfolio. That could change in a big way soon, as the tiny $263 million company will report top-line data for all three of its late-stage trials in 2017. That includes two phase 3 trials and one phase 2 trial for its leading drug candidate, CR845, a first-in-class pain treatment being investigated in pruritus, a severe skin itch condition, as well as postoperative pain. The market doesn't seem very excited about it, but successful outcomes for CR845 could bring plenty of attention to the company's novel drug class. In animal trials, CR845 was shown to be more selective for the receptors that induce inflammation and pain, while sparing other receptors that impact the central nervous system. Such an opioid would provide all the benefits of pain relief and avoid the messy side effects such as sedation, depression, and the ability to become addicted to the medication -- a widespread, underreported issue in the United States. 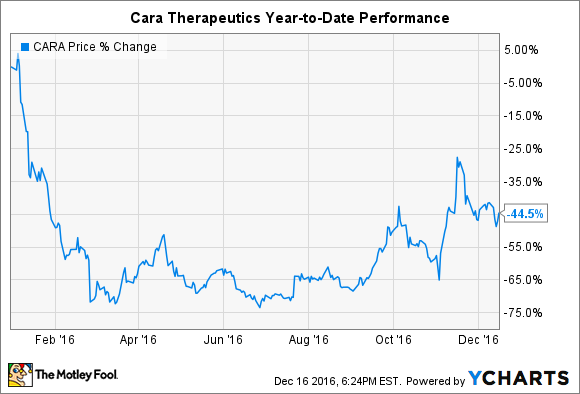 If Cara Therapeutics proves the selectivity of CR845 in human trials in 2017, then investors would have a real winner on their hands. But the binary nature of the upcoming events presents a major risk to investors that should not be overlooked. As the list above demonstrates, investors on the lookout for companies that could double revenue in 2017 will need to take on risks in stocks that others have brushed aside. Whether because of manufacturing issues, shareholder dilution, or a pending succeed-or-fail outcome, the companies above are imperfect investments. If events unfold in a favorable way, then investors could enjoy market-beating upside. If they don't, then you could be left holding the bag.